As the founder of the Huffington Post and CEO of Thrive Global, Arianna Huffington has spent a lot of time perfecting the delicate art of achieving a work-life balance. 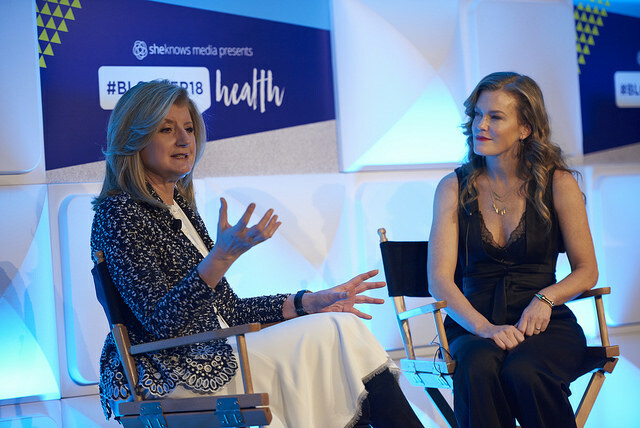 On Wednesday, Jan. 31, Huffington attended SheKnows Media’s BlogHer18 Health conference and shared some of her best tips for living a successful, fulfilling and, most important, joyful life. It probably comes as no surprise that our cell phones are one of the biggest reasons we overwork ourselves to the point of exhaustion. ”We are becoming more and more addicted to our phones and social media, and the impact is getting worse and worse on mental health, on depression, on anxiety, and people are feeling more and more isolated from each other,” said Huffington. Well, Thrive Global is giving people the tools they need to have a healthier relationship with technology. Thrive Global’s app, Thrive, is an easy way to disconnect from your phone and reconnect to your life and the people in it. It might sound ironic that an app can help you unplug, but it makes sense. “You download the Thrive app, and you use the Thrive mode when you want to have real time to have a meal with a friend or your children, your loved one or to do deep work,” Huffington explained. When you set your phone to Thrive mode, anyone who tries to call or text you will receive an automated response letting them know you’re in Thrive mode. You won’t receive any notifications until after you turn off Thrive mode and are ready to reconnect with the digital world. Before you panic and think, “But what if there’s an emergency?” don’t worry, because you can create a VIP list of contacts whose notifications will still come through despite being in Thrive mode. The app also tracks how much time you spend on all your social media apps so you can check your usage and cut back if you learn you’re spending an exorbitant amount of time scrolling through Instagram or Facebook. “It’s basically a way for us to have a digital coach to help us make small behavioral changes to better our lives,” said Huffington. If you’re ready to make some healthy changes and reinvent your relationship with technology, the Thrive app is now available for Samsung devices and will be available for iOS soon.